Making the focal point of your room and beautifully complimenting your furniture, area rugs are an important part of your interior décor. It may be smaller in size as compared to carpeting, but the beauty it adds to your room is magnificent. Available in a variety of textures, colors, and patterns, area rugs add to the aesthetics of your room. However, just like carpets you must get area rugs cleaned. Benefit from our professional Gainesville area rug cleaning services to retain the beauty of your rugs for years to come. It’s important to periodically have your rugs cleaned for many reasons. Not only does it help keep your rugs looking great, but it also helps remove all the dirt and allergens that tend to accumulate overtime. Dirty area rugs are known to be hotbeds for dirt, dust, germs, allergens, pet dander, rotting food crumbs, tiny bugs and bacteria. If you don’t get them cleaned regularly, you and your family can be exposed to serious health risks such as asthma and respiratory issues triggered by the presence of pet dander, dust or dirt. 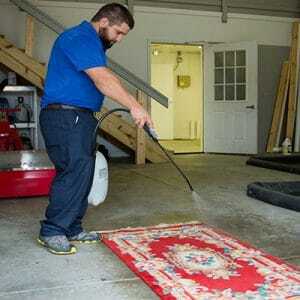 Therefore, get in touch with us, The Best Restoration, for Gainesville area rug cleaning services. We provide the highest quality of cleaning services using the best cleaning methods, technology, products and equipment at the most affordable pricing with complete customer satisfaction. We offer deep cleaning services helping you get rid of the toughest stains, pollen, dust, hair, debris, and loose dirt. According to a study, an 8×10 feet rug has a capacity to hold up to 75 pounds of debris and soil down in its fibers before it even starts to look dirty. So, you can easily imagine the dirt being accumulated in your rug, especially if you haven’t benefited from professional Gainesville area rug cleaning services from The Best Restoration. At the Best Restoration, when you hire us for cleaning oriental rugs, you’ll be happy with your decision. We have a team of highly-skilled, experienced and well-trained Gainesville area rug cleaners who make sure that every cleaning job is completed to our client’s expectations and with full satisfaction. And this is evident from our dedication; customer focused service approach and detailed area rug cleaning process. Our team of Gainesville area rug cleaners are trained on the latest cleaning techniques and provide customers with the highest quality of services from start to finish—taking care of your precious heirlooms. Our work process is comprehensive and customer driven. Therefore, when you call us for rugs cleaning services, our team of Gainesville area rug cleaners will inspect your area rugs and outline the expected results. Then we will determine the proper cleaning process for your specific type of rug. We can pick up the rugs from your home or you can come to our plant and drop them off, whichever is convenient for you. At The Best Restoration, we start the cleaning process by removing dry soil with the help of a cutting-edge machine called Rug Badger. 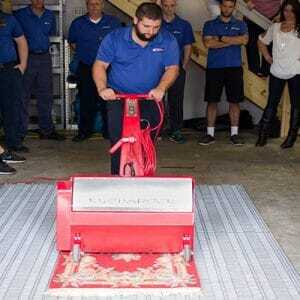 By using this machine, along with special vacuum attachments and a variety of cleaning techniques, dry soil is smoothly and quickly removed from both sides of the rugs—back and front. The next step is pre-treating the rugs with eco-friendly and top quality products that will emulsify the soil but will not damage your rugs. Emulsifiers are selected based on the type of soiling and fiber content. Our expert cleaners will then use special solutions for difficult spots and fringe areas for maximum removal of the spots and soil. All rugs are then cleaned with a high quality oriental rug shampoo. This shampoo is exclusively designed for rug cleaning and protects its sensitive fibers— keeping your rugs texture and softness intact. The rugs are then washed using extraction equipment from both sides. Gainesville area rug cleaners then dry clean the rugs removing all excess water using rollers & truck mounted extractors. Next, we hang the rugs in a controlled environment to ensure they are completely dried. Lastly, we use blowers and dehumidifiers to make sure that there is no water or moisture left. After the rugs are dried, they are combed with soft groomers and delivered to your home. Call us on (352)234-8994 to schedule for rug cleaning services today. We’ll pick up the rugs from your home or office, clean them and deliver them back to you. Give us the opportunity to serve you.